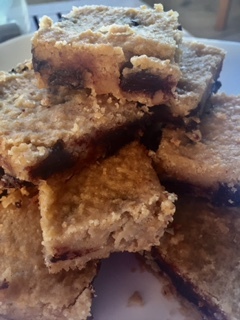 It has been a bit of time since I posted a new recipe…between going on vacation with my family, having a sick baby, hurricane Irma, and of course work, time has been pretty limited. But the hurricane is gone, things have calmed down and we have survived. Irma didn’t cause any damage on our property and our electricity was only off for a little more than a day so we were pretty lucky. Especially when considering all of the downed trees and fences in our neighborhood. Because of all our hurricane prep, I now find myself up to my eyeballs in canned beans. I used a can of black beans to make burrito bowls for dinner last night and me and Baby V both had leftovers for lunch today… But i still have like 10 cans of various kinds of beans taking up precious space in my pantry. So I’m sure many of you in Florida are also facing a similar problem. And I have a few solutions. 1) Hurricane season is not over yet so you can always save them in your garage or some other place, or 2) Slowly try new recipes and experiment with them. If you choose option 2 (which is way more fun), I have some links to a few of my recipes for you and will also share my Almond Chickpea Blondies recipe. It is super almondy – so if you love almonds you will loooooove these. If you are not a huge fan of almonds then definitely check out the list below for other options for using up those canned beans. Oh and also I just want to mention how super super easy this recipe is. 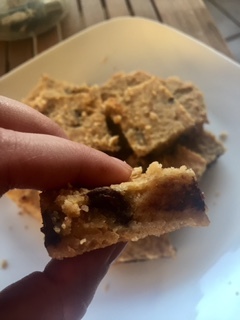 I love recipes where I dirty minimal dishes and basically just mix everything together and bake…these Almond Chickpea Blondies are just that type of recipe. Mediterranean Quinoa Bake – I use a combination of fresh and canned ingredients (including chickpeas) to make this simple flavorful vegetarian bake. Perfect for Meatless Monday or any other busy weeknight. 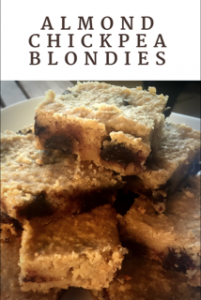 Coffee and Cream Brownies – Black bean brownies made with coffee and cream cheese to help hide the “bean” taste. Great for coffee and/or chocolate lovers. Turkey Chili – Uses both kidney beans and black beans, and has some pretty great flavor. Peanut Butter Black Bean Brownies – Definitely one of my favorite brownie recipes – classic combo of peanut butter and chocolate. Also… super easy. Preheat oven to 350 degrees. Spray glass pan (8×8) with cooking spray. Add all ingredients except the chocolate chips to a good blender or food processor and blend until smooth. 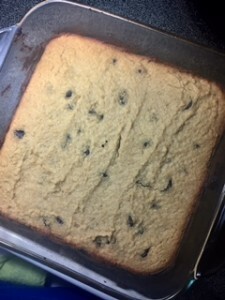 Fold in chocolate chips and spoon onto prepared pan. Bake for approximately 35 minutes or until edges start to brown and an inserted toothpick comes out clean. Allow to cool before slicing.